Please note there are nine walks in and around Carrick Castle other than along the shore-side road. There is a new one (to be photographed) which goes around Carrick Castle village that goes up from Carrick Farm by the car park just on the hill track and back down by the Carrick Castle Estate Lodge & Barn and back to the road. It takes about an hour to walk and has great views of Loch Goil and the village. Five are accessed from the north end of the village, beyond the river Carrick where you will find a small rough road that goes past some new houses. Go over the gate by the farmhouse and up onto the track heading up the glen towards the water treatment building. There is one track (Walk 3) that goes straight up the glen with the river on your left and the other two (Walk 1 and Walk 2) go off to the right as you go up this track. Walk 5 and Walk 6 are extensions to Walk 2. Walk 5 goes to the Lochan nam Cnaimh and Walk 6 goes up to the top of Cruach Mountain. Walk 1 – At the north end of the village walk up this track – just 20 minutes round-trip to see the view. Walk 1 – Track to the Old TV Aerial Viewpoint. Walk 1 – View looking to the north east from the end of Walk 1 at the Old TV Aerial. Walk 1 – The spectacular view of Loch Goil and Carrick Castle looking to the south east from the end of Walk 1 at the Old TV Aerial. Walk 2 – At the north end of the village walk up this track – 1 1/2 to 1 3/4 hours round-trip to do Walk 2 from here to the end of the track and back to here. Walk 2 – Keep straight on at this junction on the track for Walk 2. The turning to the right takes you on Walk 1. Walk 2 – Straight on here for Walk 2 & 5. The turning to the left takes you to the water treatment plant! Walk 2 – Turn right here for Walk 2. It’s approximately 1 1/4 hours round trip to the end of the track from here and back to here. The track ahead takes you on Walk 3. Walk 2 – It’s a long trek uphill on Walk 2. Walk 2 – Walk 2 can be seen from the Visitor’s Mooring as it cuts its way up the hillside towards Cruach Mountain. Walk 2 – Looking back over Carrick Castle and Loch Goil. Walk 2 – Walking up the track with Cruach Mountain in the distance. Walk 2 – The track continues on up… Just after this pond there is a track that doubles back to the left. This track is a farm quad bike track that goes to the large lochan. You need to take a map if you go this way in case the visability becomes poor. This is the start to Walk 5 and from this point to the lochan and back will take you couple of hours. From the lochan you can traverse the plateau towards Cruach mountain and climb up the mountain that will take you a further couple of hours round trip. There are fantastic views from the top but this walk requires you to be prepared and it is not one to be done on the spur of the moment… Keep going straight for Walk 2. Walk 2 – A view of other mountains from the track including the Cobbler. Walk 2 – The end of the track on Walk 2. Walk 2 – And the last of the four views – Cruach mountain. Walk 2 – View of Loch Goil and Carrick Castle further down the track. Walk 2 – A final look back to Cruach mountain. Walk 2 – Looking down on Carrick Castle. The blue Visitor’s Mooring is the outer buoy to the left in the picture. Walk 3 – At the north end of the village walk up this track – 1 1/4 hours round-trip from this point. Walk 3 – Keep straight on at this junction on the track for Walk 3. The turning to the right takes you on Walk 1. Walk 3 – Looking back at the view of Loch Goil. Walk 3 – Straight on here for Walk 3. The turning to the left takes you to the water treatment plant! Walk 3 – Straight on for Walk 3. The track to the right is the access to Walk 2. Walk 3 – Heading up the Glen on Walk 3. Walk 3 – Looking back at the view of Loch Goil on Walk 3. Walk 3 – Heading further up the Glen on Walk 3. Walk 3 – The end of Walk 3 at the Carrick river. Walk 3 – The Carrick river at the end of Walk 3. Walk 3 – View of Loch Goil from the glen on Walk 3. Walk 3 – View of Loch Goil and Carrick Castle on return from Walk 3. Please note that this walk is being changed as the Carrick Woodlands are being felled in 2016 & 2017. Once the trees have been felled this walk will be completely revised. In the meantime there is is a new track to the left after going through the gate and although very steep it takes you up to the plateau and ridge. Carrick Castle Walk 4 – The walk starts at the gate just on the south side of the new bridge that is south of the castle. This is a fairly steep track taking 1 hour round trip through the forest. Unfortunately there are quite a few trees that have blown down over the track, the first just 20 minutes away but currently you can’t get past them (2013 onwards). The path has now in 2014 been dug up with a ditch across it with a new track leading south to the left. The new track is worth walk up to see the views however it is very steep in parts. The end of the old track that used to go straight up is 175 metres high. The photos shown are ones of the old track and the second gate and sign have been removed (2015). You could previously walk on beyond the old track over a small bridge but you need a map and wellington boots. This walk will be revised once the trees have been felled and the walks re-photographed. Walk 4 – The walk starts at this gate just south of the new bridge that is south of the castle. This is a fairly steep track taking 1 hour round trip. Walk 4 – The second gate on Walk 4 is the entrance to Carrick Wood that is privately owned. The track goes on up through the woods. It can be very wet and slippery. This gate has now been removed (2014). Walk 4 – Carrick Wood sign. On it you will see there are two tracks shown off it, one to the right and another to the left. Neither are now tracable as they have overgrown from lack of use. This sign has now been removed (2014). Walk 4 – Just twenty minutes walk from the first gate and five minutes from the second gate, a large tree has been blown over across the track. You can no longer pass by it (2013 onwards). There are several other trees after this that have also fallen across the track. Walk 4 – The end of Walk 4 at 175 metres high. From here you can walk further off the track but you need a map and wellington boots as the path takes you alongside the river. Walk 4 – If you decide to walk on beyond Walk 4, you come off the track and cross this bridge. You need a map and wellington boots as it will be wet under foot going up alonmgside the river. Walk 4 – Looking down the track from the end of Walk 4 at 175 metres high. Walk 4 – The walk back down the track through the woods. Walk 4 – View from the walk going further down the track. Walk 5 – At the north end of the village walk up this track. Walk 5 – Keep straight on at this junction on the track for Walk 5. The turning to the right takes you on Walk 1. Walk 5 – Looking back over the view of Loch Goil. Walk 5 – Straight on here for Walk 5. The turning to the left takes you to the water treatment plant! Walk 5 – Turn right here for Walk 2. It’s approximately 3 hours round trip to the lochan from here and back to here. The track ahead takes you on Walk 3. Walk 5 – It’s a long trek uphill on Walk 5. Walk 5 – Walk 5 can be seen from the Visitor’s Mooring as it cuts its way up the hillside towards Cruach Mountain. Walk 5 – Walk on up past the gate that may be open or closed. Walk 5 – Walking up the track with Cruach Mountain in the distance. Walk 5 – When you reach this pond just after it there is a track that doubles back to the left. Walk 5 – The start of the track to the lochan. Walk 5 – This is the first of a few burns to cross on this track. Walk 5 – Where the water flows over the rocks there are large icicles in winter! Walk 5 – Another view of Cruach when nearing the lochan. Walk 5 – First view of Lochan nan Cnaimh (400 metres). Walk 5 – Look back towards Carrick Castle – you can just see Loch Long. Walk 5 – Still on the track towards the lochan. Walk 5 – View of Lochan nan Cnaimh (400 metres) with Craig Sgoilta (767 metres) and Caisteal Dubh (779 metres) behind. Walk 5 – Lochan nan Cnaimh (400 metres). Walk 5 – View to the north over Lochan nan Cnaimh. Walk 5 – Lochan nan Cnaimh ruined shieling. Carrick Castle Walk 6 to Cruach nam Miseag mountain (606 metres) is an extension to Walk 5. Allow 6 hours round trip from and back to the castle. Altough Cruach nam Miseag is only 1 1/2 miles in a direct line from the village the round trip walk is 9 miles, so take plenty of water. Cruach nam Miseag summit is reached from the back of the mountain. The 20 additional photographs taken on this walk start from the lochan and go along the walk to the views from the top of Cruach nam Miseag. From the top on a clear day you can see the Paps of Jura, Ben More on the Isle of Mull, Cruachan, the Pap of Glencoe, Ben Nevis, Ben More by Cranlarich, Ben Lomond, The Firth of Clyde and much more! Walk 6 – Walk 6 to Cruach nam Miseag (606 metres) is an extension to Walk 5 to the lochan. View looking across to Loch Goil on the way up. All the following photographs show the way up to the summit. Walk 6 – Looking back to the lochan. Walk 6 – Looking back to the view of Loch Goil from the walk up to Cruach nam Miseag. Walk 6 – About a third of the way up from the lochan to Cruach nam Miseag. Note you have to walk around the back of the hill to the left of Cruach nam Miseag. Walk 6 – The walk passes this peat bank. Loch Goil in the background. Walk 6 – Another view on the way up just before you head round the back of the hill mentioned with the fifth photograph. Walk 6 – Another view to the north west on the way up. This is the way around the back of the hill mentioned with the fifth photograph. Walk 6 – Cruach nam Miseag can now be seen from the back of the hill. Walk 6 – This shepherd’s quad bike track leads to the back of Cruach nam Miseag. Walk 6 – This is the back of Cruach nam Miseag – climb up this to the summit (606 metres). Walk 6 – Cruach nam Miseag’s summit (606 metres) is now ahead. Walk 6 – The cairn on the summit of Cruach nam Miseag (606 metres) with Loch Goil to the south east. Walk 6 – View to the west from Cruach nam Miseag. Walk 6 – View to the north west from Cruach nam Miseag. Walk 6 – View to the north from Cruach nam Miseag. Walk 6 – View to the north north east from Cruach nam Miseag with Lochgoilhead and Loch Goil below. Walk 6 – View to the south east from Cruach nam Miseag with Gair Loch and the Firth of Clyde in the background. Walk 6 – Looking down on Carrick Castle from Cruach nam Miseag (606 metres). Carrick Castle Walk 7 – It is also possible to walk to Ardentinny in about 4 hours (12.9 km / 8 miles one way, village to village). The first part of the walk after Ardnahein to the south of the village has now been restored. The Carrick Castle Amenities Association, in association with other organisations (Lochgolihead Community, Loch Lomond & Trossachs National Park & Argyll & Islands Leader) obtained the funding for this project and work was completed in the spring of 2010 and officially opened on 9th May 2010 – See the Ardentinny to Carrick Castle official opening walk here. Alternatively you can walk just the first part of this walk to the forestry road that takes about 1 hour to it and 3/4 hour back. We now have photographs of this part of the walk that starts from the castle. Please note there is a ‘Geocache’ on this walk – for more information go to http://www.geocaching.com. Geocaching is a high-tech treasure hunting game played throughout the world by adventure seekers equipped with GPS devices. The basic idea is to locate hidden containers, called geocaches, outdoors and then share your experiences online. Geocaching is enjoyed by people from all age groups, with a strong sense of community and support for the environment. Search for a geocache below or learn more about getting started. Walk 7 – From the castle head south on the road. Walk 7 – Walk past the public toilets and slipway. Walk 7 – Walk over the bridge towards Ardnahein on the private road. Walk 7 – Looking back towards Carrick Castle. 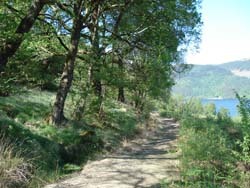 Walk 7 – View towards the entrance to Loch Goil. Walk 7 – Ardnahein Point. Walk 7 – Ardentinny sign says 4 miles – go right just before the gate. Walk 7 – Walk right up to the gate, that says to the left of it ‘Ardnahein Private’, and turn sharp right on to the new path heading towards Ardentinny. There is another sign ‘Ardentinny’ at the start of the path but it is not visible until you reach this gate. It takes 15 minutes to reach the start of the new path from the castle. Walk 7 – The path goes round the back of Ardnahein Farm. The path undulates up and down for this next section. Walk 7 – The path continues behind the buildings. Walk 7 – Ardnahein Bay on the south side. Walk 7 – Great view of Loch Goil and Cruach Mountain to the left when looking north. Walk 7 – Wild Orchids can be seen along this path. Walk 7 – The path runs around the back of Toll nam Muc (Swine’s Hole) a nice anchorage between the two red buoys. Walk 7 – The path behind Swine’s Hole. Walk 7 – Swine’s Hole looking north – It takes 30 minutes to walk to this point from the castle. Walk 7 – The new path finishes just after the gate to join the old path. Walk 7 – The path then crosses a small burn. Walk 7 – The bridge was constructed in 1998. Walk 7 – The path crosses a ford – plenty of stepping stones but beware when crossing the burn in spate. Walk 7 – View looking north over Loch Goil towards Cruach Mountain. Walk 7 – View showing Carrick Castle, Cruach mountain and Loch Goil on a better day! Walk 7 – The path continues up through the forest. Walk 7 – The path through the forest. Walk 7 – The path rises quite high at this point. Walk 7 – View towards Loch Long. Walk 7 – View of Loch Goil and Cruach Mountain looking north. Walk 7 – Looking back at the path to Carrick Castle from the foresty road to Ardentinny showing the sign on the right. It takes 1 hour to this point from the castle, however only 45 minutes back due to going mainly downhill. Walk 7 – To continue on to Ardentinny turn left on to the forestry road. Don’t turn right as it is a dead end 15 minutes up the hill. Walk 7 – The forestry road zigzags downhill and on to Ardentinny. There are currently no more photographs of the route to Ardentinny on this website. Local facilities at Ardentinny include a hotel, cafe, shop and public toilets. Carrick Castle has only public toilets. There are also public toilets in the Forest Enterprise car park that is near Shepherd’s Point north of Ardentinny (these particular ones are open in the summer only). This route is available in more detail with an associated map in the Footprint Guide to ‘The Cowal peninsula’ available from Tourist Information Centres. OS Map Explorer 363: Cowal East. The Cormonachan Woodlands, situated on the west shore of Loch Goil half way between Lochgoilhead and Carrick Castle is in the Argyll Forest Park part of the Loch Lomond & Trossachs National Park. The woodlands are ancient Atlantic oak woodlands with many oaks over 300 years old with areas of old coppiced hazel probably from 100 years ago. Much of the area had been under planted with Sitka Spruce by Forest Enterprise between 1950 and 1960. Many of those areas were felled in the late nineties and later in 2006 and 2017, new planting of oaks, rowan, hazel and Scots pine has taken place. Rhododendrons and bracken has increased in quantity especially in the northern felled section of the woodlands, however a programme of clearance has reduced much of this in recent years. The most important wildlife to reside in these woodlands is red squirrels that are high on the agenda for protection. A joint woodland project was started in 1997, with co-operation between Ardroy Outdoor Education Centre and Forestry Commission Scotland, who own the ancient Atlantic Oak Woodlands. Formal agreement was reached for the partnership to be responsible for managing 58.9-hectare sectionof the woodlands to improve their bio-diversity and also to develop them as an education resource. A new not-for-profit community organisation was set up in 2015 called Cormonachan Woodlands Association with AOEC Trust Ltd (Ardroy Outdoor Education Centre) and obtained its management agreement with Forestry Commission Scotland in 2016. 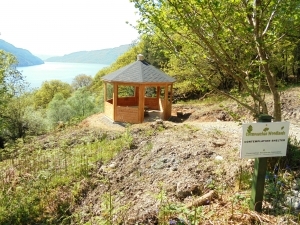 Over the last two decades the woodlands area has been transformed with long walking paths established for recreation with view points over Loch Goil, a red squirrel trail provided with information points, a resource centre has been built for educational purposes and many volunteers have cleared much of the area of old tree debris and rhododendrons. The woodlands are accessed from G.R. 196 975. The short walk of 1 km is the Red Squirrel Trail to the south of the area and the long walk around the whole area is approximately 2 ½ km. Please note the paths have several steep inclines on them but are rated as easy to moderate on the inclines. Britain’s Atlantic Oakwoods are the most extensive remaining fragments of an ancient woodland type that was once more widespead around the oceanic western rim of northern Europe. Often described as ‘temperate rainforest’ due to their wet, humid climate and abundance of lower plants and ferns, they have a particularly high nature conservation and scenic value. In past centuries they were regarded as an important resource by local communities but have declined with the cessation of traditional management and the development of new threats during the 20th Century. Within the European Union, ancient Atlantic Oakwoods are restricted to oceanic coastal fringes of the British Isles, France and Spain, with most of this resource occuring in Western Britain. Atlantic Oakwoods have a long history of local management and utilisation and were highly valued by the people who lived in and around them for providing grazing and shelter for livestock, a renewable supply of firewood and timber, plentiful wild game, charcoal for iron smelting and bark for tanning leather. By the beginning of the 20th Century this continuity of traditional management that helped to ensure their health and survival had largely ceased. As a result of this, together with increased grazing by deer and sheep, invasion by rhododendron and the planting of fast growing commercial conifer crops, the condition of most Atlantic Oakwoods has declined. The Cormonachan Woodlands are being conserved as a long-term conservation project by Cormonachan Woodlands Association. Link to Gallery. Walk 9 is a new walk around Carrick Castle. It is accessed from the new track up to Carrick Castle Estate Lodge and Barn near the Carrick River bridge. Walk up this track and pass the barn taking the track to the right until you join the original track on Walks 1, 2, etc. where you turn left. Continue up the path passing the water treatment building on the left and then take the next turning to the left that takes you down to a new bridge across the Carrick River. This path then takes you over the hill behind Carrick Castle village and down to Carrick Farm where you come into the village car park by the castle. The walk ranges between easy and moderate up and down the hill sections and takes about one hour. Walk 8 is another walk about 2 1/4 miles away at Cormonachan Woodlands just outside Carrick Castle on the road to Lochgoilhead by the TV aerial where there is a new car park (2017). Cormonachan Community Woodlands – There are two easy to moderate walks of 1 km (circular Squirrel Trail with Red Squirrel Hide) and 2.5 km circular path. The Cormanachan Woodlands Association have added way marker posts to the paths in 2016. Buses from Carrick Castle pass the woodlands 5 times a day each way, except on Sundays. The bus times are displayed in the bus shelter by the car park behind the castle. This walk has it’s own website at Cormonachan Woodlands. There are various benches and picnic tables in the woodlands and beautiful views across Loch Goil with a Contemplation Shelter and a Red Squirrel Hide.